Something that is abundantly clear on this blog is my love for this city. However, here's something that I'm probably going to get flamed for: I'm not a big fan of college football (eeeek!) although I'm pretty sure I have the class of 2032's UT football kicker here at my house. 1. When you get a moment, check out Longhorn Fashions. Even if you're not a UT fan, they have other great items for sale. 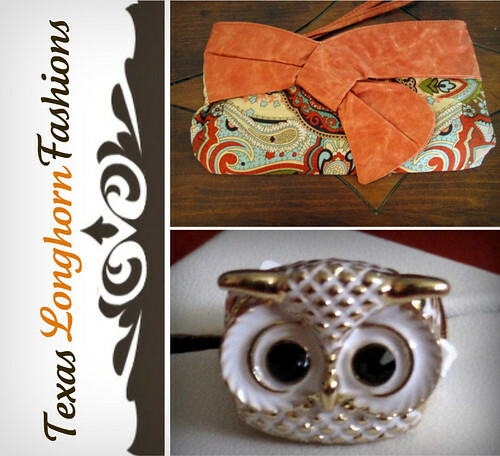 You may even want to add 'em on Twitter @LonghornFashion for exclusive discounts. Good luck, everyone! We'll draw two winners. No need to retweet or repost or any of that madness for extra entries. *note: After the winner has been announced, I delete all your information from my inbox and server to ensure your privacy. I will never share your email address with others without your permission.